Janusz Korczak was a Polish author, physician, and child pedagogue. He was famous in Poland much due to his writing is his fiction and pedagogy specially his children book like Kaytek the Wizard - was seen as part of the Polish canon of children's literature. It was highly popular during the 1930s, both in Polish and translated into several other languages. In more modern reviews and discussions, the book has been often compared to the Harry Potter book series. In in 1940, his orphanage was forced to move from its building into the Warsaw Ghetto. When the evacuation of the ghetto started the sad reality was that the children of the orphanages lacking any working permits where among the first to go. Korczak who was a famous figure in Poland was offered a number of times to save himself and leave the Ghetto , but refused to leave his children behind. On August 1942, German soldiers came to collect some 200 of the children of the orphanage as well as a dozen staff members to transport them to Treblinka. Many In the Ghetto saw this odd procession led by Janusz Korczak of the children marching to the Umschlagplatz. Some here want us to believe the nothing evil happened to them , they even mock the raising of the most obvious and demanded question - what happened to them ? Yet i think this questioned should be asked , So i ask you again , specially to those " transit theory fans " , what happened to this children ? how is it possible that 200 children went on a train yet non of them ever surfaced or reappeared or seen ever again ? BTW, his real names was Henryk Goldszmit. How do you know that he and his 'children' were even sent to Treblinka? Since you 'believe' that he and his children were murdered, rules of jurisprudence demand that you prove they were murdered. Please prove these people were murdered, present the proof. Please tell us the basis for the precise claim that Goldszmit / Korczak was murdered on Aug. 7, 1942. Why then is there no precise claim for the alleged children's deaths? Why the bother & expense to send all these people to be "exterminated" when cheap bullets could have handled the matter more efficiently, more quickly? Please give us your proof that Treblinka was in fact a "death camp" for the extermination of Jews and others. How were the exterminations supposedly accomplished? Please be specific. Where are the alleged human remains of 900,000 Jews at Treblinka, please show them. That's 10 X the LA Coliseum's capacity of 90,000. The storyline says that children were supposedly killed because they were unfit for work, but then why were so many healthy children allowed to stay at Auschwitz and await the Soviets? how is it possible that 200 children went on a train yet non of them ever surfaced or reappeared or seen ever again ? How do you know? How can you be certain that they were sent anywhere and didn't live on in the country and how do you know they didn't live in plain sight not needing to be a celebrity or achieve some sort of fame? When people say they were never seen again in cases like this please tell me what they would have to do to 'be seen again'. Some people just get on with their lives and wouldn't even consider that being one of these children was of interest to anyone. I have said this before so apologise to those who have seen this already, but my ex wife's aunt's husband was a German jew from a middle class family. They left Germany in, I think, 1938-9 for UK. After the war he emigrated to Canada and lived happily and successfully. He wasn't interested in judaism and married a British Christian girl. They came to see us regularly and in about 1999-2000 the last time I saw him he chuckled when he told me about how he and all his family were listed as holocaust death victims. He never had any thought to go to Germany and correct the story or run about naked in his old neighbourhood shouting 'I'm alive, they didn't get me or my family!' He just lived his quiet life. He was a really nice and genuinely pleasant man. borjastick wrote: ...the last time I saw him he chuckled when he told me about how he and all his family were listed as holocaust death victims. The Yad Vashem database is full of people who survived the war, some of them famous. Of course every time we name one of them here, they remove them, as happened with Rudolf Vrba aka Walter Rosenberg, so I'm not going to give them any more. Why? If we continue, they'll have to complete database cleared soon . I just hope you took screenshots. CENTOS was the the Central Association for the Care of Orphans, which ran schools and provided food, clothing and shelter. These self-help organisations employed hundreds of people, offering a daily bowl of soup as salary. In the Warsaw ghetto They provided Soup kitchens and homes for hundreds of orphaned children who begged and staved in the Ghettos street. I see no reason why would you imply that there was something wrong with that. Same goes for Janusz Korczak who devoted his life for helping orphaned children and there is nothing in his biography to suggest that he acted in anyway but admirable. That was under the most unfavourable conditions at a time when some ( not judging just saying ) where more busy saving there own skins. Again i see no reason for your insinuation that this was not the case. - Please provide the basis for the precise claim that Goldszmit / Korczak was murdered on Aug. 7, 1942. - Please provide the proof that Treblinka was in fact a "death camp" for the extermination of Jews and others. - How do you know that he and his 'children' were even sent to Treblinka? - Why then is there no precise claim for the alleged children's deaths? 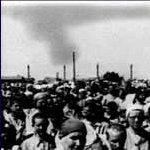 - Specifically, how were the "exterminations" at Treblinka supposedly accomplished? Be specific. - Where are the alleged human remains of the alleged 900,000 Jews buried at Treblinka? Please show them. - Why the bother & expense to send all these people to be "exterminated" when cheap bullets could have handled the matter more efficiently, more quickly? - The 'holocaust' storyline says that children were supposedly killed because they were unfit for work, but then why were so many healthy children allowed to stay at Auschwitz and await the Soviets? - Why do you ignore the link / information provided by Carto's Cutlass Supreme? Please respond to the questions / challenges. You said CENTOS stands for "Central Association for the Care of Orphans," but the Eichmann trial transcript say that it stood for "Jewish psychological and psychotechnical institutions in Poland"
institutions in Poland - :"Centos"? of the directors of "Centos" in Warsaw? And I am proud of the fact that the first revolver we received from the Polish anti- fascists for the Jewish anti-fascist bloc, we received in my room, in the room of the director-general of "Centos," in the same way as I am proud of the fact that amongst the one thousand workers of "Centos" there were hundreds who were active in the undergound. Subsequently the ghetto fighters obtained help, not just on a single occasion, first of all from the Polish progressive circles, first and foremost from the Armia Ludova. In the efforts to save children, I also acted myself to a certain extent. We also had connections with the Polish institutions for aiding children, and with the progressive parties, and also with the Catholic groups. A certain number - I think it is nevertheless possible to talk about thousands, not many thousands - but thousands of Jewish children were saved thanks to the help of Polish progressive as well as Catholic organizations. SOURCE: Eichmann Trial session 26. It indeed sounds already suspicious on face value alone. As for the presented version, how did they know this? 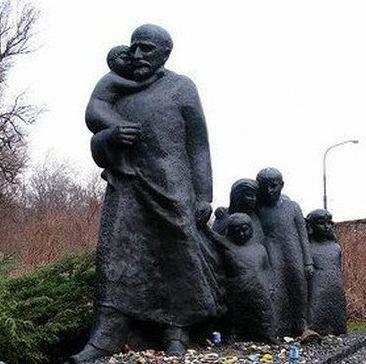 (Korczak leading the orphans to death). Sounds like a lot of hearsay and combined with the Berman/Centos effect it gets highly suspicious. I just reread the whole thing, plus my 2004 post. The Korczak shtick, if I can use that yiddish word, was just a psychological manipulation seizing upon popular trends that had originated in America and were reverberating around the globe. Notably the Pollyanna story (a book about an orphan with a positive outlook that came out in 1913) that was so big that "Pollyanna" was a name I had heard of as a kid in the 1970's. This trend of positive outlook and the John Dewey ideal of "Learning by Doing" was happening in the 1930's as can be seen with How To Win Friends and Influence People by Dale Carnegie in 1936 and continuing after the war with Power of Positive Thinking by Norman Vincent Peale in 1952. Orphans: they don't really exist in the USA or Europe anymore, but did at one time, but the best thing to do for them is to get them adopted into a home with two adults who can take the role of a mom and a dad. Often a relative. Not create some self-governing micro-model government comprised of orphans, which you can then talk about, like Korczak, how this model society of orphans works so well, and how that shows us, on a micro level, so many lessons about how well communism would then work. Or how well a utopian ideal in a future state of Israel might work. Warsaw Jewish Psych Warfare wasn't perfect: ideally the Little Boy Photo with his Hands Up, should have been one of Korzcak's orphans. Yes, that's a Warsaw Jewish Psych Warfare photo, but it doesn't have a direct Korzcak connection. It's still the most powerful photo of the holocaust myth, but would have been even bigger if it could have been connected to Korczak. The Korczak orphan story is one of Warsaw Jewish Psych Warfare successes along with the Little Boy Photo, The Stroop Report, and Year in Treblinka by Jankiel Wiernik. Korczak likely faked his own disappearance for the sake of this powerful propaganda story, and if I were to guess where he lived out his life, one place that comes to mind is the Ghetto Fighters' Kibbutz, in Galilee, Israel. This idea that orphans would have been some of the first to be deported. To use the late Anthony Lawson's phrase "Were the Germans so stupid?" to not have a clue about what public opinion that would engender? And weren't those alleged deportations done in cooperation with the Judenrat? The governing Jewish body of the Warsaw ghetto? What would that procession of orphans do for their popularity?